Once we had traveled to the south-eastern part of Sicily, the architectural style of the buildings began to look less medieval and more Baroque. This region had been continually plagued by earthquakes, and a particularly devastating earthquake in the 1600s destroyed many of the buildings in Ragusa and in other surrounding areas. Thus, the structures were rebuilt in popular Baroque style of the period. 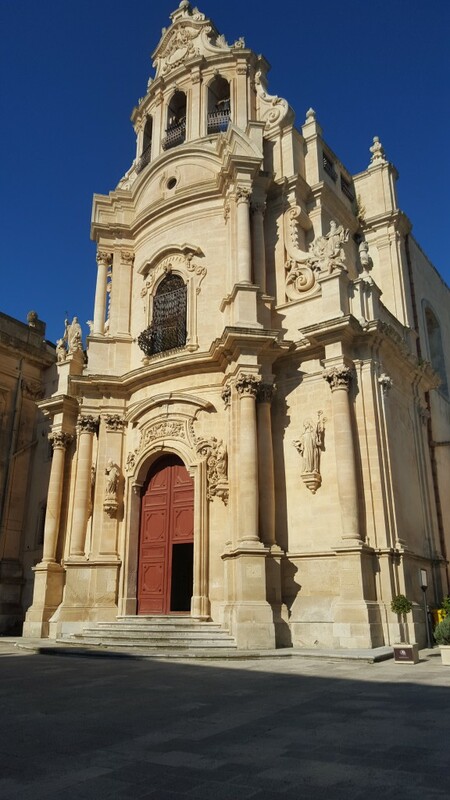 This church in Ragusa (seen above) encompasses the most important characteristics of Baroque art. Baroque architecture can be considered as a dramatic re-imagination of the Classical style. The columns on the façade of this church are Corinthian, but the entasis is highly exaggeration. Entasis, or the slight bulging of the columns in the middle, was utilized by ancient architects to create the illusion of perfectly straight and aligned columns; without entasis, and other tricks to fool the eye, a temple can look as if it is falling inwards. In this case, however, column entasis was used to heighten the dramatic flair of the entire structure. The Baroque artists also preferred the more elaborate and decorative Corinthian column to the more simple Doric and Ionic styles. Additionally, the tympanum above the columns was modified from its original, triangular structure into an assortment of warped shapes. The curved contour of the overall church façade also departs from the emphasis in Classical architecture on straight lines and imparts a sense of exaggerated motion. Finally, the statues on the exterior of this church are found in poses that express a dynamic movement to their forms. Baroque art was supposed to inspire awe and feeling within its viewers, coinciding with the mission of the Catholic Church in this period which encouraged its members to focus on a purely emotional relationship with religion. The Church wanted people to be swept away by the grandeur and glory of God and to experience their faith through sensation rather than reason.